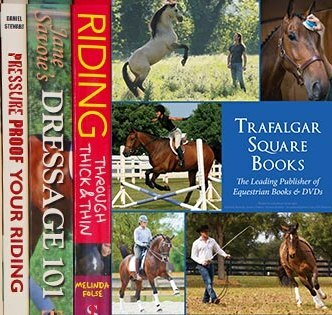 Trafalgar Square Books was established in 1985 with the publication of one of the best-selling horse books of all time — CENTERED RIDING. Today our list of titles represents the who’s who of the horse world with books and dvds by many well-known experts including Linda Tellington-Jones, Sally Swift, Clinton Anderson, Jane Savoie, Gerd Heuschmann, Mary Wanless, Lynn Palm, Sandy Collier, Betsy Steiner, Ryan Gingerich to name only a few. The company is owned and managed by horse people who themselves own, train and ride horses.